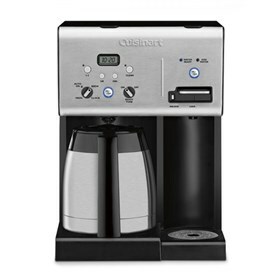 The Cuisinart CHW-14 coffee machine features hot water feature which allows consumers enjoy their favorite instant coffee, hot cocoa, soup and tea simultaneously or independently. The separate hot water system has its own power button and 56-ounce water reservoir. This fully automatic machine brews up to 10 cups of coffee at a time with auto-on and auto shutoff, self-clean function and 1 to 4 cup brew setting. The machine has Brew Pause™ feature which allows for pouring a cup before the brew cycle has completed. Other highlights include easy to use indicator lights, removable drip tray, gold tone filter and a charcoal water filter for removing impurities. It comes with 10-cup thermal carafe with a drip-free pour spout and a comfortable handle. The 10Cup Coffeemaker System Thermal Programmable W/ Hot Water has many exciting features for users of all types. You can extend the lifetime of your 10Cup Coffeemaker System Thermal Programmable W/ Hot Water with the purchase of a FactoryOutletStore Factory Protection Plan. See the 10Cup Coffeemaker System Thermal Programmable W/ Hot Water gallery images above for more product views. The 10Cup Coffeemaker System Thermal Programmable W/ Hot Water is sold as a Brand New Unopened Item.